Hello everyone! My name is Thomas, and I'm a student here at JLI. I come from the great state of Tennessee in America. This month at JLI we've been having summer break. During this break I've been able to do a lot of stuff I wouldn't normally have time for. Just last night I got home from a trip to the resort town called Noboribetsu. Noboribetsu is a town in southern Hokkaido famous for its hot springs. There I got to spend my very first time ever in an onsen. It was a little embarrassing. 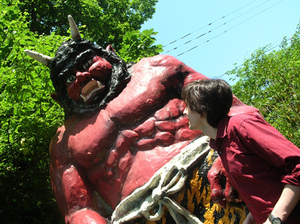 For some reason, Noboribetsu really likes oni, Japanese demons. There were statues of them everywhere. 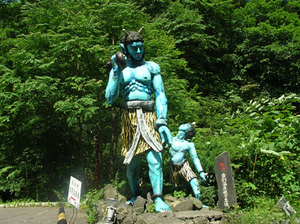 This was the first time I had ever seen a blue oni. I wonder what they are.